On Wednesday, Chicago was colder than parts of Antarctica by 10 degrees Fahrenheit. Cold Arctic air will bring temperatures near or below zero degrees Fahrenheit for more than 100 million Americans. A disruption in the swirling mass of air above the Arctic Circle – a pattern known as the polar vortex – is causing this weather event. Although counterintuitive, it's possible that global warming leads to these kinds of disruptions. Temperatures are lowest in the Midwest and New England, where about 25 million people are projected to face temperatures of minus 20 degrees Fahrenheit, with wind chills of around minus 60 in parts of Minnesota and North Dakota. On Wednesday morning, Chicago was colder than Antarctica by 10 degrees at minus 21. "The heart of the Arctic cold has arrived," the National Weather Service's Chicago office said on Twitter. "The combined effects of the cold & winds are at their peak today with wind chills of -45° to -60° continuing. The afternoon highs today...yes the highs...will only be -11° to -17°." Nationwide, at least two people have been confirmed dead and thousands of flights have been cancelled. "You're talking about frostbite and hypothermia issues very quickly, like in a matter of minutes, maybe seconds," Brian Hurley, a meteorologist with the Weather Prediction Center, told the Huffington Post. The frigid temperatures are caused by a mass of cold air that leaked from the polar vortex in the Arctic Circle. The polar vortex is an area of cold, low-pressure air that swirls in the stratosphere above Earth's North and South poles. When it's strong, the polar vortex swirls in a regular pattern above the Arctic Circle, contained in part by a strong jet stream that keeps the cold air up north and the warm air down south. But sometimes the winds that power the polar vortex weaken, resulting in a destabilized jet stream that shoots cold air to the south – what's known as a polar vortex event. Although the polar vortex isn't new, scientists still aren't exactly sure what factors destabilize it and cause these extreme weather events. In recent years, however, some climate scientists have suggested that global warming might be causing disruptions above the Arctic. ​Does global warming cause polar vortex events? Possibly. 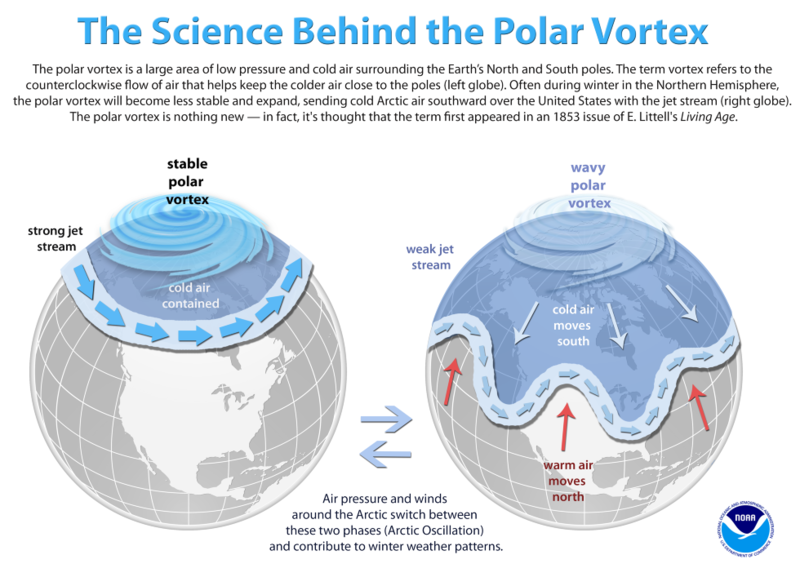 Although it seems counterintuitive that global warming might cause subzero temperatures, it's known that warm air can weaken the polar vortex. So, considering that the Arctic is warming at faster rates than the rest of the planet, it's possible that global warming is disrupting the polar vortex above the North Pole, resulting in a weakened jet stream – the barrier that keeps the frigid Arctic air contained in the north.